These super quick, easy, yeast-free apple fritters are made a little healthier with 100% whole grains (but you really can’t tell with all the cinnamon that’s in there!) Naturally dairy-free. I always thought it was useless to “healthify” fried food. I mean, come on, what’s the the point? 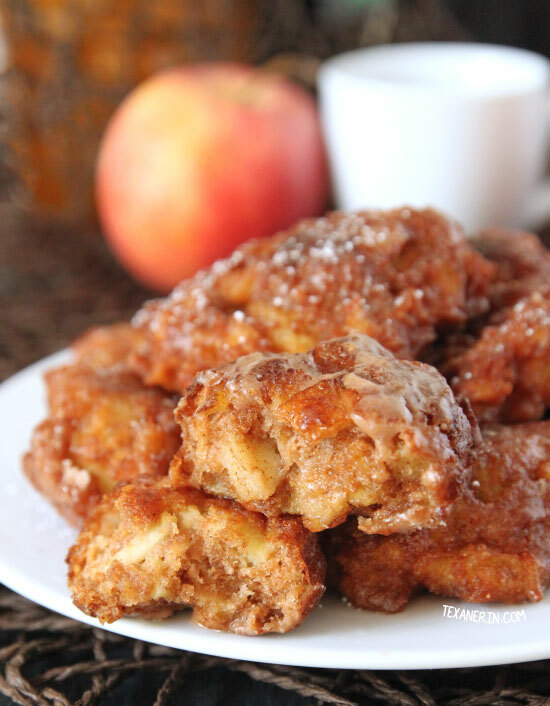 I tried it anyway with these apple fritters and they are amazing. Don’t need or want to try any other fritter recipes! This is the one for me. This apple fritter recipe is not only delicious, but also incredibly easy. When I have a long day of work, sometimes I’ll come home to Mr. Texanerin frying me up a few of these fritters as a surprise. I swear… if he can do it, so can you! I love that they don’t have yeast. I tend to screw up anything with yeast and I hate waiting. These apple fritters just use baking powder! I’m not kidding when I say I was laughing maniacally when I bit into the first one. And it left me dancing around the rest of the day. SO happy. And somebody who doesn’t like whole grain goodies loved these and requested peach and plum fritters! I promise it’s not scary to fry these apple fritters! I only used about an inch of oil. And I tried using a super small amount, like a teaspoon per fritter. Don’t do this. Just fry the suckers. You won’t be disappointed! In a medium or large pot, preferably with high sides to minimize mess, pour enough oil so that there's about an inch covering the bottom. If you have a thermometer, use it! Heat it to 350°F / 176°C over medium high heat. Meanwhile, peel and chop the apples (I used about three apples but go by the gram measurements). I chopped them pretty finely, but not too finely. You want to be able to notice them! When the oil reaches 350°F / 176°C, and not before, add the apple juice and egg to the dry mix. Gently stir until combined and then fold in the apples. Do not over mix! To fry the fritters: I highly recommend frying one fritter first, just to make sure the oil is at the right temperature (my thermometer lies sometimes) and to get the hang of it. If the first one doesn't come out how you'd like it to, do one at a time until you've find the best way for you. I took two tablespoons of batter at a time, flattened it slightly in the palm of my hand, and then used a butter knife to help get the sticky fritter batter off my hand and into the oil. I can see this being dangerous because of the oil, so you could also just flatten them slightly on a plate and then slide the fritter into the oil. Or you could drop spoonfuls of batter into the oil, but the cook time might be affected. Fit as many as you can in the pot without overcrowding them. They shouldn't be touching. Fry each side for one minute, and then flip, for a total of two minutes. After the two minutes are up, use a slotted spoon to remove the fritters from the oil and place them on a paper towel lined plate. Make sure the oil is still around 350°F / 176°C and then fry the remaining fritters. While the fritters are cooling, prepare the glaze by mixing all the glaze ingredients together in a bowl big enough to dip the donuts in. If it's too runny, add more sugar. This is enough glaze to only lightly glaze the donuts. Once the donuts are completely cool, dunk the donuts in the glaze and make sure you get both sides. Let the fritters sit on a cooling rack until the glaze hardens, about 15 minutes. These didn't last longer than an hour, but I'm pretty sure these are best when super fresh, just like all donuts. 50 comments on “100% Whole Grain Apple Fritters” — Add one! Hello, how do you store them and for how long? These were super yummy! I needed to use up some blueberries, so I used those instead of apples, but I kept all the other measurements the same. I did use sprouted wheat flour and fried in palm shortening. I found that medium high was way too hot for my stove-top. I fried on medium low once I got the oil hot. I also had to add a bit more apple juice to my batter, but I think that’s because of the flour I used. Also do you think I could use moscovado sugar? Hello, they look so good. Do you think they would be ok if baked in the oven? It is so good in baked goods as well as frying. And it is a safe high heat oil. Ahhh, these look so incredible! I'm afraid of frying(not sure why exactly, I have done it before I just really don't like to…) I used to avoid it because of health reasons too, but really, a treat is a treat, you might as well live it up :D And speaking of twitter, I am so bad at it too! Um… I should go check it now…. Lol! Whoops… how did I miss this?! Sorry, Heidi. And don't be afraid of frying! It's fun. :D And yeah, I'm still bad at Twitter. I just can't get into it. Thank you for sharing this recipe! I made these and they turned out delicious. The apples came from an apple tree my grandmother(deceased) planted when my father was a young child. Can't wait for them to blossom next year, then I can give to the whole family. Again, Thanx!!! Wow, these look really amazing! I havent had a fritter in years either, but these look just perfect, and I would LOVE to sub these for any store bought ones. So YUM! Erin these look delicious! I want to visit your kitchen again!!! I think it's the actual act of frying that always freaks me out. These look so good though…I just might have to get brave and figure it out! Get yourself a frying thermometer and go for it! It's not scary at all. And then you'll have fritters. Yay! These look fantastic! I may just have to try frying. . .
Oh boy, these fritters look scrumptious. I love it when a dessert makes you dance. Yum! Thanks! And yeah, dance inducing sweets are the best! Yum – your apple fritter look delicious! I may need to try these. We are going apple picking next weekend! 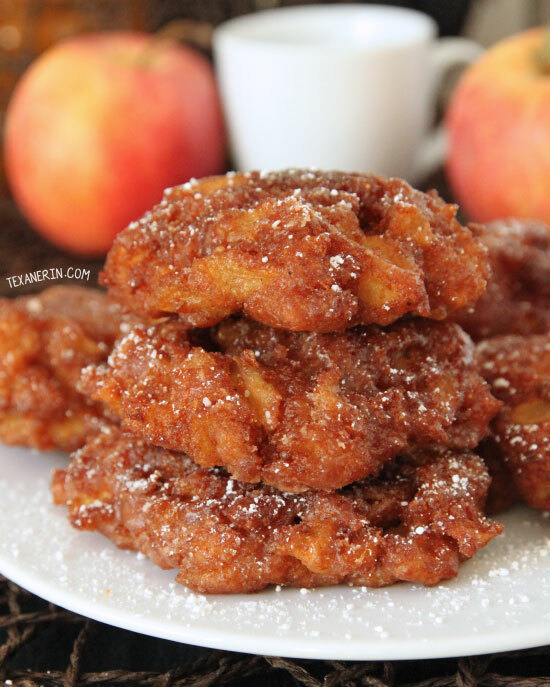 Mmm…these apple fritters look soo yummy. I wonder, did you ever look into whether frying with coconut oil makes things healthier? Isn't strange how we click with one social media and almost get addicted to it, but others we can't seem to warm up to? I am not very good at tweeting either, and Google+ still confuses me. I haven't even thought of that! I imagine it would be healthier but that would require a LOT of coconut oil. They come in small packages over here so I don't think I'll be doing that. I don't even really know what Google+ is really for and I've got to find you on Twitter! We can be bad together. I should have realized that coconut oil isn't as available everywhere as in Asia (where coconuts grow like crazy everywhere). I am just so fascinated by all the health benefits it offers that it made me wonder about it's frying capabilities. Does it come in huge packages over there? I guess it wouldn't take so much oil. I'll look into it! Frying with coconut oil would be a bad idea as it has a low smoke point. Maybe if you were outside? Olive oil would be fine but personally I have not found one yet that I like for baked goods. I taste it strongly. Yum!! How good do these look?! I am horrible at twitter too. I try, but I am just not good at it, so you are not alone! Wow! These look so yummy! I've been wondering what I'll do with my apple bounty this season. Thanks for the great recipe idea! I definitely don't see anything wrong with a fritter every now and then; they look wonderful and I bet they taste even better! They do! The pictures didn't do them justice. I couldn't go on taking pictures and not eat them. It was like torture. I love these, Erin! Fried treats are definitely worth the splurge every now and then! I think frying desserts in genius. As long as one doesn't have them all the time and have large quantities all at once, I think eating some is perfectly fine. I also think trying to healthify frying goodies is quite smart :-) the healthier the ingredients the better!! These are sure something that I would like to try. Just curious, why do you say not to add the egg and the apple juice to the dry mix before the oil reaches the specific temperature reading? You have to try them! SO good! You don't want the baking soda to start reacting too quickly, which I was worried it might do sitting in all that liquid. Maybe it doesn't matter, but I wasn't going to risk it with my precious fritters. :) I always said I'd never get a Twitter account but here I am. I just have to get into it!